The Left angel Incarnation cross of Separation contains the energy and rhythm to realize when it is time to separate and move on. A key aspect of this is to realize when we are done with an experience coupled with being open to new things. Take a look a our two celebrities Prince and Kim Bassinger. Prince was a rock icon in the midst of hugely wide popularity. His movie and album purple rain drew vast attention from the public and media. And then an interesting thing happened. He decided he wanted to change the experience and so he changed his name into a symbol. This certainly changed things because all the radio an media now had to refer to him as the artist formerly known as Prince as there was no way to say the symbol on the radio. I’m not sure if that was what Prince was after but it sure did make a change. Kim Bassinger was a budding actress in the 1980’s with a great deal of popularity. Yet she struggled with the popularity and diminished in visibility from the public eyc. She was married a couple times, the latest to Alec Baldwin. After they divorced in 2001, she went to great lengths to keep him separated from their daughter. Here are the gate names, the I Ching names, followed by brief descriptions for the 4 gates of the cross of the Separation. Gate 22 – Openness – Grace – This is the energy to openly share emotional experiences with others. This is a gate of being social. Gate 47 – Realizing – Oppression – This is abstract thinking and the energy to fit all the pieces of the puzzle together or filter out the one nugget from the mass of data that makes sense. There is a lot of pressure in this process. 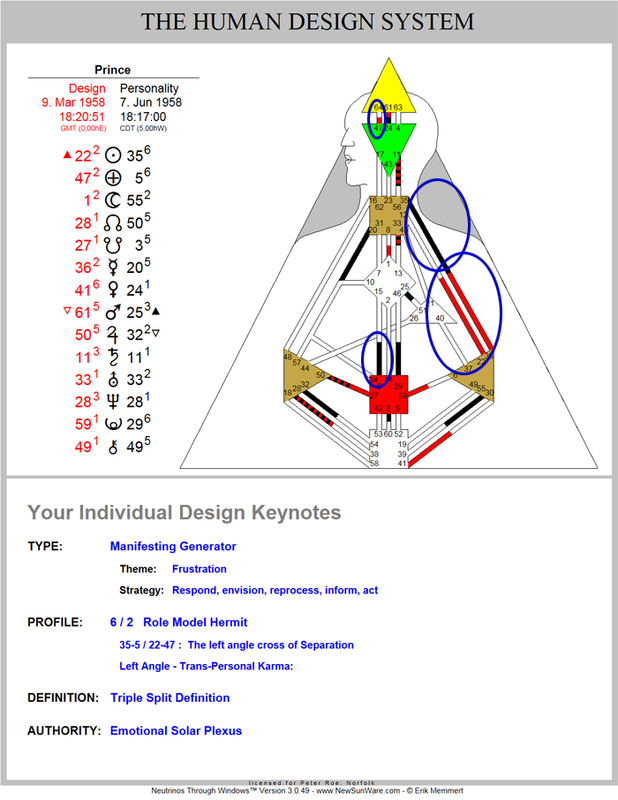 Gate 5 -Fixed Rhythm – Waiting – This energy is being in sync with the natural rhythms and may be visible in eating, sleeping and working. 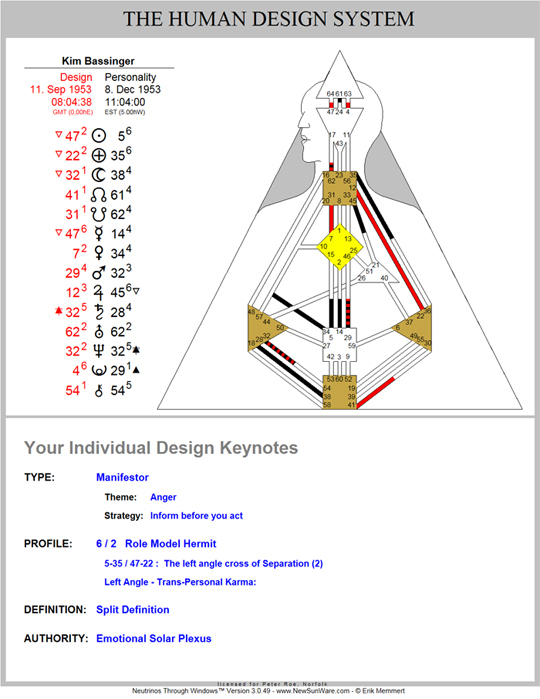 Gate 35 – Change – Progress – This is the energy that can tell us what the experience has been about and how we should change are approach, if necessary, to make it different. 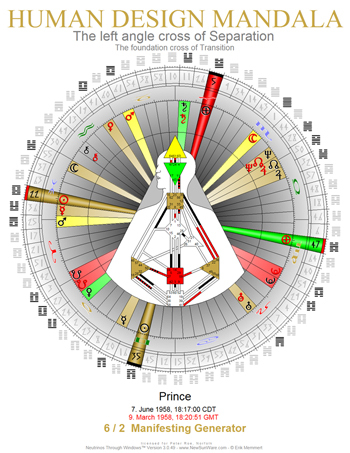 Here are charts for Prince who were born under the cross of the Separation. 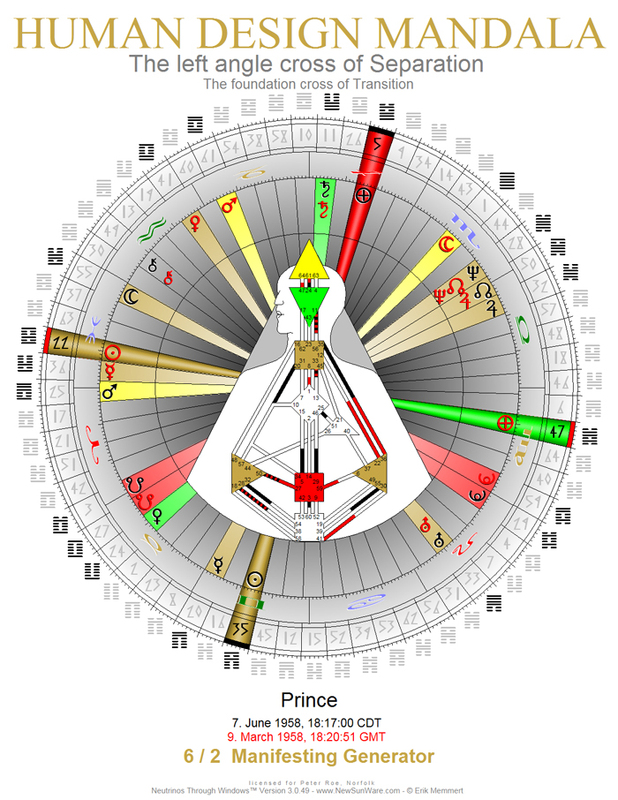 The four gates of the cross of the Separation are circled in blue on the chart for Prince.